Collaboration is an integral part of any healthy design process. White Cloud Design prides itself in its ability to collaborate with a wide range of talented architects, builders, and artists – both regionally and nationally – to help individuals, organizations, and municipalities connect with their environments. WCD adds value and efficiency during planning and design phases, enabling projects to save time, resources, and money. When everyone can “see the big picture” and take a holistic view of a project, it is possible to develop practical and innovative design solutions that are not only aesthetically pleasing, but also functional, complementary, and enduring. White Cloud Design’s commitment to collaboration extends not only to the professional building community, but also to their clients. Together, they work to ensure that the finished project reflects personalities, respects budgets, complements lifestyles, and successfully brings visions to life. Our earth and landscape are forever changing and evolving, as are the materials with which we build. White Cloud Design believes in pushing the boundaries of creative design and construction techniques in novel directions that meet and exceed the status quo. In a world of diminishing natural resources and concern for the environment, today’s innovative design and building techniques aren’t merely “new” or “modern,” they’re also “smart.” White Could Design is a strong proponent of “integrated site design,” an innovative approach to sustainable building and site design that involves maximizing existing natural systems to produce and apply low-impact materials. By incorporating intelligent applications – such as the use of permeable materials and green roof technology to assist in storm water management, or the fabrication of a retaining wall that minimizes the use of concrete, steel, and labor – White Cloud Design works to not only improve the quality of life for clients, but also that of the planet. Since its inception, White Cloud Design has been equally committed to the environment as they are to any specific project. Whether it’s a rooftop garden or an elaborate water fixture, WCD strives to achieve a balance between nature and culture, demonstrating responsible care for the land while satisfying ordinary and extraordinary demands of modern life. White Cloud Design is a member of the American Society of Landscape Architects (ASLA) and the U.S. Green Building Council (USGBC) and is passionate about exploring and utilizing sustainable practices, green elements, and Low Impact Design (LID) strategies to contribute in significant ways to LEED and “Green Building” projects. By minimizing the environmental impact of construction and creating beautiful and vibrant outdoor spaces that truly coexist with their surrounding environment, White Cloud Design blurs the boundaries between indoor and outdoor habitats. 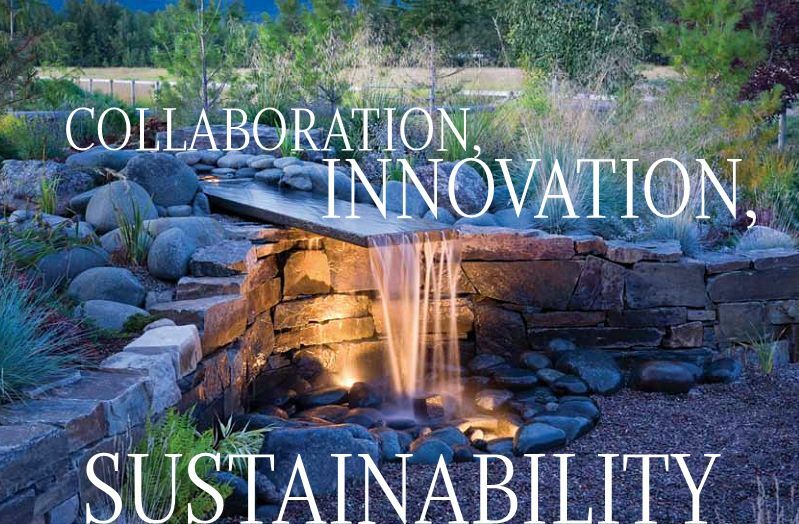 From minimizing or eliminating turf to integrating native vegetation and locally-sourced materials, WCD offers creative solutions that can help to “greenscape” any environment and promote sustainability. Johnny McDonald founded White Cloud Design in 1995. Born and raised in Sun Valley, he learned early about hard work, design aesthetics, and respecting the environment while working for landscape contractors. As a student of Landscape Architecture at the University of Idaho, Johnny engaged in a variety of projects and activities that further developed his love and understanding of natural dimensions. His early experience with building enables him to bring practical insight regarding the construction process to a project’s design phase. Since moving to Whitefish, MT in 1999, Johnny has participated in numerous projects in the Flathead Valley, ranging from residential to municipal and commercial. Living in the Rocky Mountains and a sustained love for the outdoors provide the ultimate backdrop and inspiration for his designs and philosophy. White Cloud Design offers ecologically integrated design and consulting expertise, gained from both large, complicated projects and smaller, intimate environments. Look to WCD for site selection and redesign; stormwater management; master planning; outdoor kitchens and living spaces; customized planting design; patios and pools, and detailed landscape design.